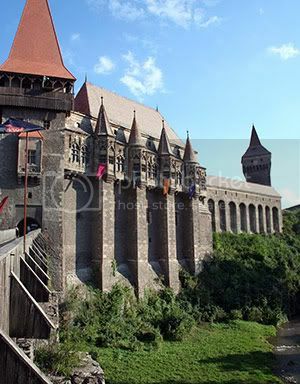 Built in the 14th century, Corvinilor Castle represents one of the most amazing and well-preserved medieval buildings, being in fact the most famous property of Iancu de Hunedoara, building that even today dominates the city of Hunedoara. Iancu de Hunedoara was the one who stopped the Turkish army at Belgrad in their rise towards Europe, after conquering the Constantinople in 1456. Only a few know that even today the bells of the Catholic Churches still toll in the middle of the day for this victory, as a decision of the Vatican Church. 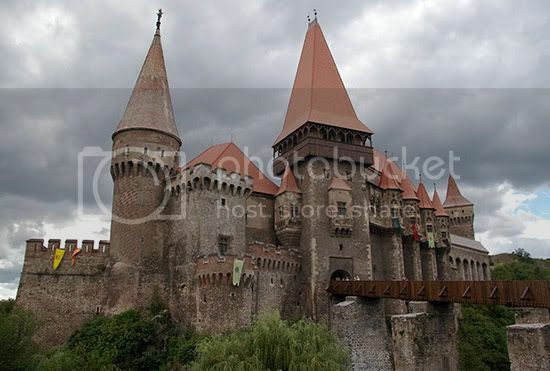 The Corvinilor Castle is one piece of a kind because of the special styles in which it was built and because of the presence of some military innovations. It is also known that people led a very impetuous life there at the castle for more than 400 years. This building suffered along the years various changes and during Iancu de Hunedoara’s reign, the castle became also a luxurious home, not only a strategic point. The castle has 42 chambers, 2 platforms, 2 bridges and is built on an area of 7000 square m.
The access to the castle is made on a wooden bridge which is sustained by 4 massive stony piers that are placed in the riverbed of Zlasti, leaving behind the Hussan’s Court and the niche that shelters the statue of St. John de Nepomuk, the protector of bridges. From there you can see the new rectangular-shaped stony tower (Turnul nou de poarta) which is impressive by its great size. 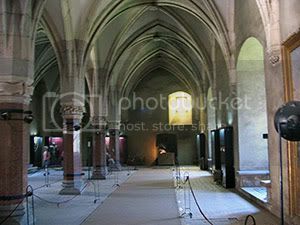 You can also visit the prison of the castle where Vlad Tepes was supposed to have been kept as prisoner. On the left side, just as you get out of the stony tower, you can see Loggia Matia at whose floor one can see the only secular fresco dating the Renaissance and also The Golden Chamber where one can see “Items of the collection of the museum from the Corvinilor Castle”. At first, the museum exhibitions focused only on the Middle Ages items, but in short time, these approached other fields, such as archaeology, ethnography, decorative art and ancient books. At the first level of the New Gate Tower, you can find the “Princesses’ Living Room” (Camera Domnitelor) where you can see pieces of furniture belonging to the 19th century: a table, a sideboard and a cupboard. Across the spiral staircase, one reaches the Council Hall (Sala Dietei), which is built in late gothic style. At the exit, the staircase leads to the floor where the Capistrano Tower is situated. To the right there is another staircase that leads to the second level of the Southern Palace, to the rooms that were used in the 18th century as offices for the iron mines Administration of Poiana Rusca Mountains. In the yard, near the well, one can also visit the artillery platform, which was neatly rearranged in the 19th century. From there you have a pleasant view over the Bears’ Pit, the Northern Palace, the chapel and the courtyard of fountain. The last sight, the Knights Hall (Sala Cavalerilor), one of the most interesting laic spaces in 15th century Transylvania, is situated in the Western side of the castle, at the ground floor of the Great Palace. It is divided into two sectors by a row of octagonal columns. This hall served as dinning room for festive occasions or as judgment and council room for noblemen, after the German model. In the vicinity of the entrance of the church, there is a fountain which was dug in stone by three Turkish prisoners. The legend says that when these three prisoners were captured by Iancu de Hunedoara from his battles against the Turkish army, they were told that if they dug in stone and reached for water, they would be released. For ten years the Turkish prisoners dug nearly 20-25 meters into stone and they finally reached for water, but instead of being released, they were beheaded. 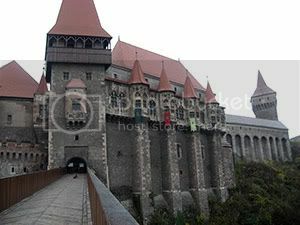 This is just a legend and it’s not specific only to Corvinilor Castle. Before being executed, it is said that one of the prisoners had carved into stone the following words: “You have water, but you have no soul”. The truth is that one of the prisoners, which was in fact the son of a vizier, carved on one of the stones from the wall near the well that he built that well together with two other prisoners while they were prisoners to these giaours.